The following day, when the ship reached Mahón, one of its officers reported to the deportees that labour lawyer Francisco Layret had been murdered back in Barcelona. 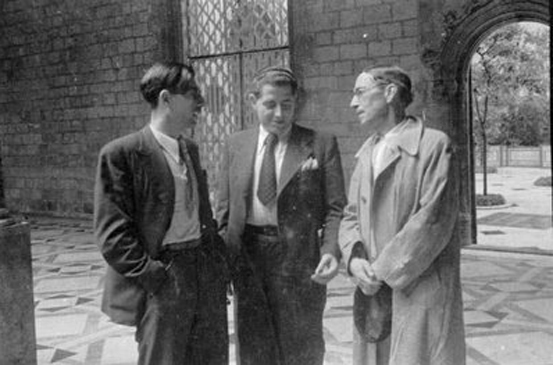 Eroles was a CNT activist with the action groups from the Sants barrio of Barcelona. He was brought to court several times. In June 1926, he was convicted of robbery, sentenced to six years and jailed in the Ocana penitenciary. A further three-year term for possession of weapons added to his sentence. In practice, he was behind bars for the entire duration of the Primo de Rivera dictatorship. He was freed under the amnesty following the proclamation of the Republic. By August 1931 he had been appointed secretary of the Weaving and Textile Union. He took part in the January 1932 and January 1933 insurrections and as a result was hauled before the courts again and given various terms in prison. From April to June 1933 he served time on the prison hulk Manuel Arnus at the pleasure of the government. In July 1936 he served as secretary of the Workers’ and Soldiers’ Council (a body put in charge of purging fascists from the Civil Guard, Assault Guard and Army), an off-shoot of Catalonia’s Central Antifascist Militias Committee (CAMC). In October 1936, by which time the CAMC had been wound up, he was appointed Public Order Chief of Staff of the Internal Security Junta amid fierce rivalry and repeated frictions with the Commissariat-General and councillor for Internal Security (Artemi Aguadé from the ERC), under the sway of stalinists and ERC personnel. He set up a bodyguard of his own, known as “els nanos d’Eroles” (Eroles’ boys) and an intelligence agency, both of them attached to his police duties. Eroles’s intelligence agency worked alongside and shared its investigations and intelligence with the CNT investigation/intelligence agency led by Manuel Escorza del Val. The one which in the summer of 1937 took over the Palace of Justice which was in use by the CNT’s Revolutionary Justice Committee, subsequently renamed officially in the Generalidad’s Official Gazette as the Courts Office. The Los Escolapios Committee which ran and orchestrated the various groups which were based in the building of that name; it, in turn, was part of the Centre (and Pueblo Seco) Defence Committee based in the same Escolapios building. The one in the Security Junta that was run by Tomas Orts on behalf of Comarcas. Although the Internal Security Junta looked, initially (in October 1936), like a continuation of the police services provided by the CAMC, in actual fact, everything had altered. Now, all of the reins were in the grip of the Internal Security Councillor and he in turn was answerable to the Generalidad government. That a number of the important posts within this new Junta were in CNT-FAI hands was simply an initial requirement, a temporary ploy to give the Junta a chance to embed and consolidate itself. Those CNT appointees could be dismissed by the government or bypassed by the Internal Security Councillor, Artemi Aguadé. The duality of powers within the Junta became yet another battle-ground between CNT personnel and the government. Whereas the CNT people wanted to turn the Security Junta into a platform that might enable them to keep Public Order under control from their position of dominance within the Control Patrols, Aguadé beefed up and consolidated a brand new Unified Security Corps, capable of supplanting the Control Patrols. This was a slow process, begun in October 1936 and ended in the beginning of June 1937. The debate about the Regulation queried whether the Junta was independent of government and had enough personnel and powers to decide in Public Order matters, as Aurelio Fernandez and Dionisio Eroles contended it did, or was merely an adjunct, an advisory body to the Internal Security Councillor, as the Generalidad claimed and was out to ensure. The fact that on 8 October 1936 Barcelona was still subject to lots of internal checks, by means of barricades and patrols gives us some idea of the menacing strength of the CNT which the Generalidad government was out to tame by drawing libertarian leaders into a Security Junta which was looked upon as an auxiliary of the Internal Security Councillor. The Generalidad government needed to draw the CNT into the Junta if it wanted control of Public Order. That Dionisio Eroles and Aurelio Fernandez thought of the Security Junta as a body independent of the government and of the Councillor and as a mere liaison between the Junta and the Generalidad, accounts for the growing disagreements within the Junta. Chief of PO Staff, Dionisio Eroles Batlle (CNT). 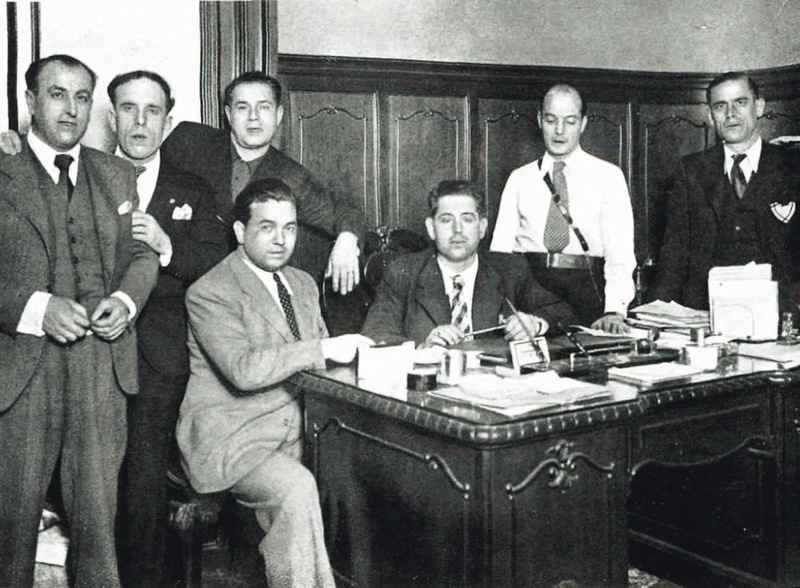 On 22 October, Eroles and Escorza (on behalf of the CNT), Pedro Herrera (for the FAI), Antonio Sesé and Rafael Vidiella (for the UGT) and Felipe García, (for the PSUC) signed a joint antifascist unity agreement, the stated purpose of which was the winning of the war on fascism. On 4 November Solidaridad Obrera carried on its front page a short article eulogising and boosting the nanos d’Eroles and in it it was stated that “the investigation teams set up by Dionsio Eroles, Public Order Chief of Staff, are working relentlessly and with the utmost effect”. The actions of those investigation teams were “hammer blows” to the Fifth Column in Barcelona. It was claimed that Eroles talked about his nanos with all the fervour of a father about his children. The writer of the article closed by glorifying “the comrades from the Control Patrols”, to whom Barcelona was indebted for her “peace of mind”. On 13 November 1936, Eroles stopped Azaña from fleeing into France and by placing him under massive police surveillance and even threatened his personal bodyguard that they would have hell to pay should Azana escape abroad. On 15 November, La Vanguardia carried a report that the Public Order Commissariat had just handed over a number of valuable items, found in the course of searches carried out of the abandoned apartments of subversive persons, to the Generalidad Treasury. The paper gave details of the cash and the items handed over, the fruits of Eroles’s bodyguard’s police work. Apparently a portion of such hand-overs which were made regularly and were of considerable value, were skimmed off by Eroles “for the union”. Eroles regarded this “loot” as a bargaining chip or fall-back in view of the uncertain and problematical future ahead. Eroles had personal custody of this “loot”. On 20 November Eroles too severe measures to ensure that no prisoners were removed from the Modelo Prison, which it was feared might happen by way of retaliation for the fascist navy’s shelling of Rosas and elsewhere along the Catalan coast. From November 1936 through to May 1937, there were constant frictions between Dionisio Eroles-Aurelio Fernández and Artemi Aguadé, the ERC Security Councillor. Eroles was against the establishment of Comarcal Patrols, contrary to the opinion of Rebull (from the Rabassaires Union), because they would be beyond the control of the CNT. On 23 November 1936, Eroles moved that the Workers’ and Soldiers’ Council be wound up as an obstacle to “proper discipline”. On 25 November, aided and abetted by Manuel Escorza from the CNT-FAI Investigation and Information Agency and by Liberato Minué (Escorza’s brother-in-law), from that agency’s espionage services in France, Eroles thwarted and exposed the planning of a coup d’état by Estat Català, led by Joan Casanovas and Andreu Revertés. According to Eroles, Superintendent Revertés had hatched a plot “the aim of which was to do away with comrades Aurelio Fernández, Vicente Gil and Solans”, the last named being Eroles’s secretary, plus President Companys. There is every indication that the hatching of a coup against Companys because of his “alliance” with the anarchists had been nipped in the bud early; the aim had been the physical elimination of several anarchist leaders “responsible for the anarchy rampant in Catalonia” and prominent among these was Aurelio Fernández. The muddled final purpose was geared towards independence for Catalonia based on backing from the fascist powers in Italy and Germany; Catalonia would secede from the Republic and from Franco’s Spain. There was a ferociously anti-CNT thread linking the Dencás-Badia Catalanist-fascist ascendancy back in 1934 within the Generalidad’s Home Affairs Department and Estat Català’s unhappiness at having been kept outside the Generalidad government in the wake of 19 July 1936. It had all resulted in this laughable attempted coup against Companys and his anarchist allies. On 26 December 1936, Eroles stated that he would tender his resignation if he was confronted with the moral dilemma of having to crack down of popular disturbances erupting in the bread queues. On 4 January 1937, The Security Junta agreed that, in future, any search or arrest would have to be done under the authority of the Commissar-General (Eusebio Rodríguez Salas) or of the PO Chief of Staff (Eroles). From January on, there were ongoing and violent personal clashes between Aurelio Fernández and Dionisio Eroles on the one hand, and Rodríguez Salas on the other, due to the commissar-general’s thuggishness and provocations. Eroles order the seizure of some illegal warehouses holding provisions and arranged for them to supply the hospitals. On 27 January 1937, Eroles defended how the Patrols and the CNT had performed in La Fatarella. On 3 February Eroles revived the Workers’ and Soldiers’ Council, this time to the growing PSUC-UGT influence over and infiltration into the police corps and military units. On 19 February, Eroles complained that his name had been misused by ‘uncontrollables’ who were carrying out searches and unwarranted or unauthorised arrests. There was a scandal following the discovery on the outskirts of Barcelona of corpses of people who had been shot and the suspicion was that some of these outrages (but not all) might have originated in CNT ranks. There was a difficult transitional period and the argument was that political violence and the crackdown against right-wingers, clergy and fascists was being enforced by the Control Patrols alone. The Internal Security Junta was out to win back its monopoly on the use of violence. The revolutionary events of July 1936 had punctured the state’s monopoly upon violence and shared it out among countless autonomous groups, not all of them anarchist or trade unionist, who used violence off their own bat and at their own risk, with hardly any supervision or requirement to answer to anyone. On 24 February 1937, Aguadé brought up several instances “in which agents of the authorities had looted and indeed murdered”. He mentioned the incidents in Vilanova i la Geltrú and in Centelles. In the first, a woman had been taken out of the hospital where she had been received treatment for serious injuries inflicted by the perpetrators of the first attempt on her life, so that they could finish her off. In the second incident, some people had been arrested and promised that nothing was going to happen to them and then they too had been murdered. Aguadé reported on the trial mounted in France arising out of the discovery in Céret of a suitcase filled with gold that a delegate from the Aragon front had had in his possession. Aguadé then went on to allude to the torre (villa) dels Pardals (Bonanova) ”where a FAI committee was operating, involving elements serving in the Public Order Commissariat under the orders of the Chief of Staff”. This was a direct attack on Eroles who held the post of PO Chief of Staff. Aguadé explained that in that torre “were found lots of prisoners who had been offered passports at three thousand pesetas a go”. He read out ”a report detailing how they were operating under the leadership of a hunchback”. Aguadé then attacked Escorza since that hunchback could not have been anyone else but Manuel Escorza del Val. Aguadé stated that he was unable to take action against the agents concerned (Eroles, Escorza and Asens) because “they are not in the government’s service but in the personal service of Officers who do not comply with the Councillor’s orders”. Aguadé boldly raised the obvious issue of several authorities coexisting within the PO Department. And he did it in a favourable setting, the Generalidad Council and at an appropriate time, when Companys had been complaining about the gravity of the public disorder around them. But he failed to offer a historical and political explanation of the situation within Public Order. The agreement which had set the seal on the CNT’s entry into the Generalidad government and upon the winding-up of the CAMC, had contained a quid pro quo whereby the CNT assured itself of a preponderant role in the departments of Defence and Public Order. The post of secretary for Defence was specially conjured up for Garcia Oliver and when the latter resigned after he was appointed Justice minister of the Republic, the post had been done away with, with the promise that Sandino (Defence councillor) would be replaced by someone from the CNT. The Internal Security Junta had also been launched (in early October 1936) on the basis of an even-handed share-out between the various forces on the ground: Aguadé (ERC) as PO Councillor, Eroles (CNT) as PO Chief of Staff, Aurelio Fernández, Control Patrols secretary, Asens, Chief of Control Patrols Staff. The position of PO superintendent, another ERC appointment, had had an eventful history, ascribable more to the ineptitude and corruption of those who had held it than to any critical and erosive action on the part of the CNT, with Revertés having been arrested and shot, Martí Rouret resigning and finally it was taken over by the PSUC member Eusebio Rodríguez Salas. The breakdown and frictions within the Internal Security Junta was a crucial factor in the political instability of the spring of 1937. On 27 February 1937, there was a demonstration by Civil Guards chanting “death to Eroles”. The Republican National Guard (GNR – formerly the Civil Guard), Assault Guards and Security Guards lined up in military formation at the funeral of the driver-officer Juan Vila, shot dead in Granollers two days earlier by armed residents of the town where he had gone in search of food supplies. As the funeral party passed down the Ramblas, there were incidents. The demonstrators “led by the national band and the drum and cornet bands of the GNR, made for the Generalidad Palace” to protest at the insults spewed at the flag and their uniform. They were met by Companys: “to whom they expressed their enthusiasm and loyal support”. Then they moved on to Police Headquarters in the Via Layetana where they had a tense meeting with Colonel Arrando. The demonstrators chanted a number of slogans and, among others, the cry “Death to Eroles!” was heard. Internal Security Councillor Aguadé had turned up to calm things down. The officers from the police forces there present demanded a unified command overseen by the Generalidad, and then disbanded without further incident. That very same day, the CNT Regional Committee stood by Eroles and rejected the demonstration. Next, the Regional Committee briefed the congress (of the Catalan CNT union) on the meeting of the Generalidad Council at which Public Order issues had been discussed without reaching any accord “due to differences in outlooks”. The RC reported that the previous night a working party had been appointed and that a draft accord was ready that day, but then along came “the incident at noon today with the demonstration by the security forces”. After the RC, the CNT Councillors on the Generalidad and the Security Junta had held a meeting, it was resolved “that at the Council meeting to be held tonight, it will be made a precondition that the Generalidad government issue a notice backing comrade Eroles who is the CNT-FAI’s representative within the Security Junta.”, since there had been criers of “death to Eroles!” uttered in demonstration by the Assault and Civil Guards that noon. It had further been agreed that, should that demand not be acceded to, the CNT councillors would resign their posts. The Liberal Professions Union put it to congress that it manifest “the completest solidarity with comrade Eroles who has the support and backing of the entire CNT organisation in Catalonia”. The plenum passed this by acclamation and the chair indicated that congress had now formally agreed it. On 1 March, Mi Revista praised Eroles for “further services rendered to the antifascist cause by Eroles, Solans and other nanos under his orders”. On 4 March, the Generalidad’s Official Gazette published seven Decrees and two Orders under which the Control Patrols were disbanded and a Unified Security Corps was set up, based upon amalgamation of the Assault Guard, which was already under the command of the Generalidad government, and the Republican National Guard (GNR: formerly the Civil Guard) which had hitherto been answerable to the central government. The significance of the new body was that this brand-new public order force, in the exclusive service of the government, was a complete replacement for the Control Patrols. No member of the new Corps could be a union or political party member. At the same time, all of the town-level Security or Defence Departments were decreed done away with and arrangements were made for patrols of militians or investigation/monitoring committees to be pulled back from posts along the border with France. This was the end of a lengthy process which put paid to the duality that had existed in the running of Public Order in Catalonia, split between the CNT and the Generalidad. However, the order disbanding the Control Patrols would not take effect until 5 June 1937 and even then that was as a result of the CNT’s defeat in the wake of the May Events, a dismal coda to the disarming of proletarians that was the overture to a widespread crackdown on the anarchist workers’ movement. On 20 March 1937, the RC appointed Aurelio Fernández, Dionisio Eroles and José Asens its advisors in respect of Public Order issues: Arias, Escorza, Riera, Portela would advise it regarding investigations; and Batlle with regard to Justice. In its 1 April edition, Mi Revista again praised Eroles’s team for its actions against the Fifth Column. On 6 April, the Regional Committee met in the Casa CNT-FAI. In attendance was comrade Torres from Perpignan who spelled out the situation of the anarchist movement in France and its current plans. He detailed the obstacles they were encountering in dispatching weapons and food into Catalonia, as well as the sabotage coming from the Stalinists. He announced that a rally was to be held in Paris in favour of the Spanish revolution. Valerio Mas read out a letter “addressed to Companys, regarding the current crisis” and the latter’s response, which it was intended to publish in Solidaridad Obrera as the culmination of “a phased attack mounted on behalf of the truth and a justification” of the CNT standpoint. Healthworkers’ Union reported a recent incident in Olesa de Montserrat where, in a clash with the old Civil Guard, one of them had been killed, leading on to the subsequent arrests of eight CNT members and to their being mistreated and the village ransacked by the reinforcements sent in by the Civil Guard. Their orders came from Rodriguez Salas, who could count on the cooperation of the PSUC. Tarrasa, Esparraguerra and Olesa had called a general strike and CNT personnel were up in arms, insisting that all of those arrested be set free. At which point Eroles walked into the meeting room, stating that he had intervened in the matter right at the outset. Aguadé had been keen to hold on to the prisoners. He called upon the RC to register a strenuous protest, demanding that all those arrested should be released. Eroles then analysed the present circumstances, explain that Companys’s reference to his willingness to step down had worsened things at Public Order, since the PSUC and UGT exploited every conflict in order to create disorder as had occurred, say, with the recent funeral of that guard. Eroles alerted the Defence Committee (which was present at the meeting) against the possibility of these “undesirables” creating mayhem among those attending the funeral of a guard who had lost his life in Olesa. On 14 April 1937, there were fracas and demonstrations in every market in Barcelona in protest at the cost and scarcity of foodstuffs and of bread. Later “the demonstration moved off down the Via Durruti in the direction of the Public Order Commissariat-General, a commission being appointed to go inside to speak to the Chief of Staff, Dionisio Eroles, from whom they sought the release of someone detained that morning in relation to incidents triggered by the protests”. Dionisio Eroles’s efficiency in pursuing those disaffected from the regime and in unearthing fascist gangs and arms caches was very striking and outstanding, as was acknowledged by the whole of the press and even many of his worst enemies. On Saturday 17 April the press carried comments made by Eroles the day before (the 16th) when questioned by reporters “as to various complaints brought by various citizens prejudiced by a number of searches carried out, in which short arms under the control of trade union and political bodies have been seized”, stated: “I am not aware of any arrangements ordering the forces of Public Order to effect searches and seizures of fire-arms, even though the bearers may have the authority of their respective trade unions or political parties, associates of the government bloc. Those possessing such weapons possess them for their own personal safety as militants who are still on active duty although in the rear-guard.“ After Eroles denied that he had issued any such order to seize weapons and so as to put paid to the muddle currently afflicting the Public Order field, he made to remind all citizens and most especially “those in charge of the Generalidad’s Investigation and Watch Corps” of the accords reached at the Security Junta and published in the Generalidad’s Official Gazette of 25 October 1936, to the effect that “authority to carry out house searches must be issued by the Commissar-General of Public Order, from the Commissariat Chief of Staff or from such authorities as to whom they may delegate the authority”. There was also the mandatory requirement that such authority cite the names of the officials charged with carrying out the search. On 27 April 1937, Dionisio Eroles had the files on those being held in preventive custody at the Commissariat in in the remand prison re-examined, ensuring that one hundred CNT prisoners were released. On 3 May, Soli stated that the PO forces were made up Assault Guards and Civil Guards (now the Republican National Guard) which, apparently, were unable to get beyond the eighth floor of the Telephone Exchange, that the deployment of forces on the streets and rooftops was spectacular “with weapons and military gear galore”, attracting the attention of “thousands of people”. Rumours were put about to the effect that it was the FAI that was attacking the building. Within half an hour of the beginning of the raid on the Telephone Exchange, “Diaz, from Defence, Asens from the Patrols Secretariat-General and Eroles had turned up” and “made a timely intervention” to get the CNT personnel to “drop their justified attitude” and “furnishing evidence of common sense and cool heads, they acceded to the suggestions of the afore-named comrades”. This was a lie: in actual fact, Asens and Eroles had been pushed aside by the barrio defence committees. On 4 May, five comrades belonging to Eroles’s bodyguard (els nanos) were dragged from their homes and murdered. This was an out-and-out manhunt with previously identified targets. On 5 May, Valerio Mas, the CNT’s regional secretary, had been appointed a Generalidad councillor and he was replaced as CNT secretary by Eroles who was acting secretary of the Catalan Regional Confederation of Labour (CNT) from 5 May to 2 July 1937, when he resigned for fear of arrest. On 19 May 1937, Eroles advised “all here present that tomorrow we should invest all of our efforts into attenuating the disastrous impact that the solution to this crisis will have made on our comrades”. He encouraged all there to make ready “to work, if only from clandestinity, deploying the same effort we did before”. An argument broke out between the CNT’s RC and the comrade representing the FAI’s RC (Severino Campos) because the latter disagreed with the NC’s manifesto’s praises for Largo Caballero. Eroles and various other comrades did their best to talk Severino Campos around. On 17 August, a court issued search-and-arrest warrants for Aurelio Fernandez and Dionisio Eroles. Aurelio handed himself in to the republican courts in a disciplined manner as the Organization had recommended; but Eroles decided to vanish for a while to avoid imprisonment. In 1938 he served on the Policy Advisory Commission CAP) alongside Juan Arans, José Corbella, Antonio Costa, Germinal Esgleas Jaume, Aurelio Fernández Sánchez, José Gallart, Juan García Oliver, Francisco Isgleas Piarnau, Emilio Mas, Eulario Oña and José María Sabaté. He carried on with his duties with the Special Intelligence Service, investigating people, actions and tactics that posed a danger to the CNT. In August 1938, Eroles’s and Escorza’s espionage services traded intelligence about Doménech Padros, working closely together in order to expose and arrest him, just as they done previously on numerous occasions with the best of outcomes. Eroles quit Barcelona on 26 January 1939, by which time Franco’s troops were already entering via Tibidabo and Montjuich. He made it to the border by car. In Paris he took part in the efforts to refloat the CNT in exile along with Marianet and Esgleas, but was soon side-lined due to his refusal to hand over the loot he was supposed to have amassed. Once Eroles managed to settle near Perpignan, he sought out Joan Solans Vallverdú, his right-hand man for such a long time. Eroles was arrested at a routine checkpoint for being undocumented in March 1939 and given a month in jail. Shortly after he was released the prefect of the Pyrénées Orientales department learned that he was on the books of the French police’s central services as “a highly dangerous fanatical anarchist”. In fact, French spy agencies had been keeping files on the main anarchist leaders ever since 1936: they included Durruti, Mariano Rodriguez, Garcia Oliver, Federica Montseny, Abad de Santillán, Portela, Aurelio Fernández and one or two others. They were all marked as highly dangerous and the recommendation was that they be refused entry. So the prefect decided to expel Eroles, ordering him tracked down and arrested, but by then he was long gone. From Toulouse, he moved on to Montauban in early May. Knowing that he was a wanted man, he adopted a new identity and managed to avoid detection for a time. The police finally caught up with him several months later but his associates reported that he had set sail from Bordeaux, bound for Chile; he escaped only to be arrested on 28 March 1940 near Montauban and was taken to the concentration camp in Le Vernet d’Ariège. There he met up with other CNT personnel such as Antonio Ortiz and Victor Castán who had been leading military commanders during the war. During his early years in exile Victor Castán was one of Germinal Esgleas’s confidants. Esgleas, who led the Libertarian Movement’s Council tried by hook or by crook to recover the CNT’s scattered resources. Together with Ortiz, Eroles explored their chances of escaping from the camp. Castán inquisitively pressed Eroles as to the whereabouts of the swag (a colloquial term for the loot he had amassed during the war). Eroles managed to dodge Castán but his personal circumstances were desperate. He was alone and isolated both from the Ponzán group’s network and from his old CNT comrades. Ortiz’s testimony, referring to the times when they were both still in the Le Vernet camp, suggests that encounters between Eroles and Castán were very stormy. According to one old and early version of events, Eroles was murdered and made to disappear in 1940 in exile in Andorra. There is one line of research that has the date of his death as 1942, in Mareilles, after several months of service with the French Deuxième Bureau intelligence agency, according to claims made by his “brother”, Isidro Eroles, made to the Spanish police back in 1951. But the whole business is very murky and does not go beyond supposition, with no documentary evidence. Maybe Isidro Eroles just made the whole thing up to get out of police custody.